Pet transport is a relatively tiny segment of United Airlines‘ business, but it was thrust into the spotlight this month as several dog incidents, including the death of a puppy on board, sparked an outcry on social media and scrutiny from lawmakers and government officials. Shipping pets in the belly of its planes generates a relatively small part of United’s cargo revenue, according to the company. That cargo business itself is minor compared with the airline’s overall revenue. The cargo unit generated just over $1 billion last year, compared with the company’s overall operating revenue of $37.7 billion, according to a recent filing. Following the death of the French bulldog puppy in an overhead bin and three mixups, including a German shepherd mistakenly being sent to Tokyo, United said Tuesday it would stop taking reservations for pets traveling in cargo, pending a review. The airline’s “immediate focus right now is improving our services for our customers and pets,” said United spokesman Charlie Hobart. While the pet-transportation unit is small, United Airlines ships more animals than any other U.S. carrier. It inherited a large pet-transportation business in its merger with Continental Airlines in 2010. Last year, United transported 138,178 animals, from mastiffs to geckos, according to the Department of Transportation. It also reported 18 animal deaths, the highest number among U.S. airlines. 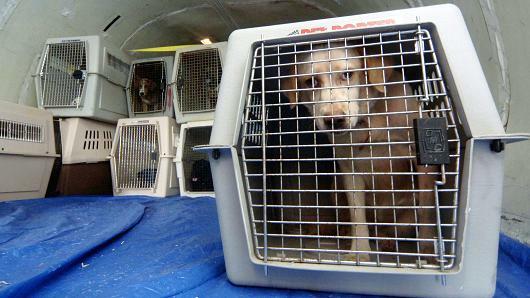 In total, 24 animals transported by U.S. airlines died last year, the DOT said. Some pets have pre-existing medical problems or are not used to the conditions of cargo-hold transportation, which has led to injuries or death, the airline said. Last year, Airlines for America, a trade group representing United and other large U.S. airlines, included the reporting requirements of animal deaths or injuries among those federal rules it would like to see repealed or changed. “These monthly reports are of little or no value because such animal losses, injuries or deaths are extremely limited in number,” it said in its letter to the Department of Transportation. So why bother operating a business that might be more trouble than it’s worth? United and its competitors have posted big gains in cargo units, thanks to online shopping, demand for fresh food and pharmaceuticals, so there are plenty of other ways to fill planes’ cargo holds. percent between 2012 and 2017 to some $46 billion, according to market-research firm Euromonitor International. And even though it’s a small part of the cargo business, airlines are keen to generate more revenue from passengers as they struggle to increase fares. The cost of flying a medium-sized dog within the U.S., excluding Hawaii, on United’s PetSafe platform is about $270. Many consumers wouldn’t think twice about bringing a pet along, industry analysts said. “Certainly customers expect to travel with their pets,” said Gary Leff, a travel expert who writes the View from the Wing blog.